Hello Everyone! It's Lindsay from the DT here with you today and I have to say that this new release has been so much fun to play with! I hope you all have been enjoying all the peeks and projects as much as I have! Today's highlights are the brand new Whimsical Wishes Stamp Set and Scene Builders Dies. 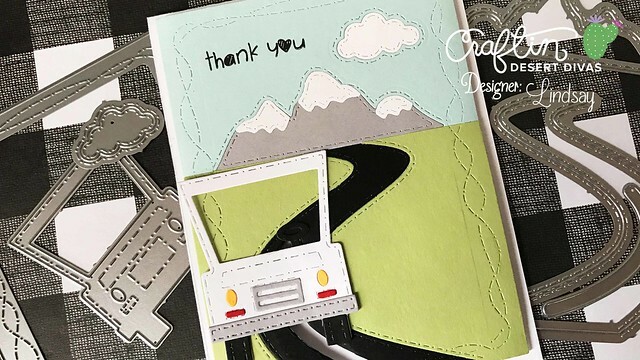 These two new items can be combined for some beautiful scene making, or you can combine them both with other CDD Products for even more possibilities! 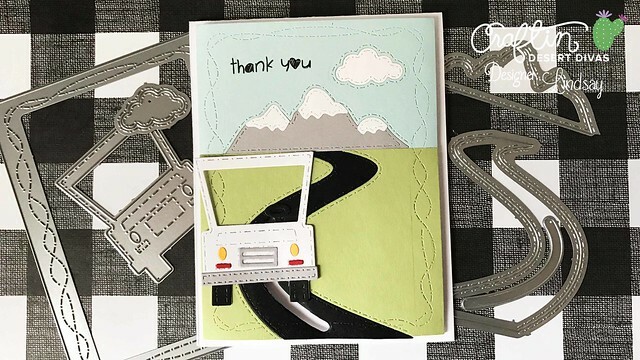 I have used the brand new Scene Builders Dies on my card today, along with last month's Trucks Die Set to create a fun and interactive die cut inlay scene! Be sure to watch the video tutorial below for all the details!! First, I used the large rectangle from the Crazy Stitched Frame Die Set and cut three rectangles, one from light blue cardstock, one from green cardstock, and finally one from black card stock. My first cut was from the black rectangle with the road die, making sure the bottom cutting edge was hanging off the bottom edge. Then, I used the same road die to cut the road into the green card stock, making sure to overlay the black panel to get exact placement. To create the sky I simply lined up the blue and green rectangles in my paper trimmer and cut them in half right above where the road ended. In the blue panel, I cut the mountains and used the same mountain die to cut a gray cutout and then the three snow caps from white card stock. Finally, I cut the cloud from the blue panel in the top right hand corner and also from white card stock. To inlay all of my pieces I cut a large rectangle from computer paper, as my backing. Then, I just started putting the scene together starting from the top and working my way down to be sure all the pieces fit together perfectly and using glossy accents to secure them into place. To see how I put together the slider, be sure to watch the video tutorial above for the full details! 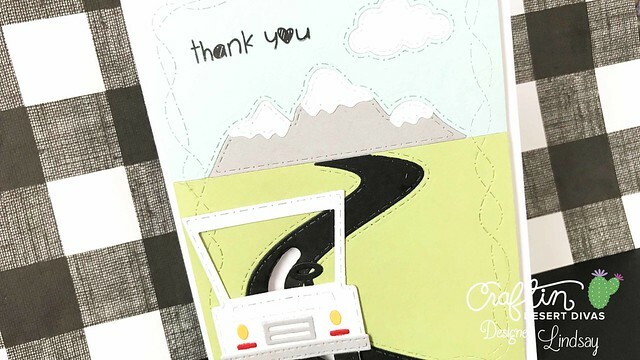 To finish the card off I stamped thank you, from the "Simply Said" stamp set, into the top left hand corner in black dye ink. Finally I popped up the panel onto an A2 top folding white card base with fun foam and double sided adhesive! If you haven't yet, be sure to head over to the February Release Event on Facebook, so you don't miss any of the big reveals for the rest of the week! There is still plenty of fun to be had! If you are interested in any of the previously released products I used on my card today, they are all linked below! Thanks so much for stopping by today!! Scene Builders Dies - Coming Soon!! Oh my....this is so cool! LOVE those dies!